In episode 23 Phil Walter joins me to talk about his transition from the the battlefield, to home, and eventually into a role where he has the opportunity to work on national security policy. I’m thankful to Phil for sharing his personal story because I think it might help others who are finding it difficult to adjust to life after war. But even if you aren’t a veteran, and even if you aren’t struggling, there’s something to learn here. Phil has served in the military, the intelligence community, and the inter-agency. His written works are catalogued on Storify and archived at www.philwalter1058.com. I highly recommend them if you are at all interested in national security issues. You can follow him on Twitter @philwalter1058 and he is a member of the Military Writer’s Guild. 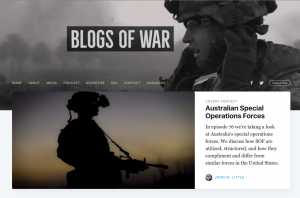 Phil’s “War and the New Normal” series that was featured on this podcast was originally published on the blog Point of Decision. If you are enjoying Covert Contact, and would like to see content like this continue to be produced, please subscribe and learn how you can support the show. The views expressed here are those of the author alone and do not contain information of an official nature.